The DM Studio System is a complete platform that includes a printer, a debinder, and a sintering furnace. 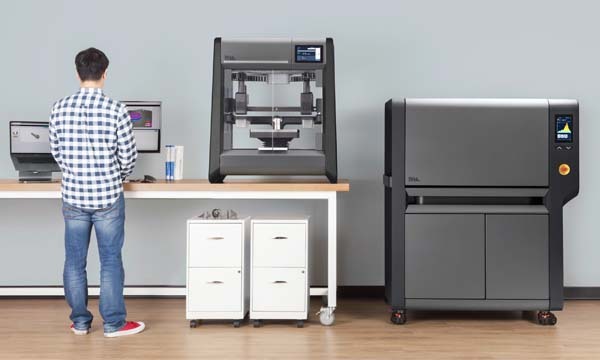 Described by Desktop Metal as “the world’s first affordable, office-friendly metal 3D printing system,” the system is designed to bring the benefits of metal additive manufacturing to the desktops of engineers. Photo courtesy of Desktop Metal. Much of the hype around 3D printing in recent years has involved products that could be produced relatively quickly from plastic materials. But metal 3D printing has been an entirely different story—one defined by arduous research and development that has unfolded slowly, away from the spotlight. Any engineer who’s worked to qualify metal 3D printed parts for critical aerospace or medical applications can tell you how long and difficult those processes can be. Perhaps even more frustrating are the high costs of established metal 3D printing technologies—powder bed fusion techniques like direct metal laser sintering (DMLS) and electron beam melting (EBM)—that have pushed those technologies beyond the reach of most engineers. Steep costs have steered metal 3D printing away from higher quantity, lower-end applications, where it isn’t economical, and toward the more selective, lower quantity, critical-use industries, where the stakes are higher, the degrees of difficulty greater, and the quality standards stiffer and non-negotiable. And until the cost barriers are solved, they’re likely to prevent metal 3D printing from gaining significantly greater traction in the marketplace. 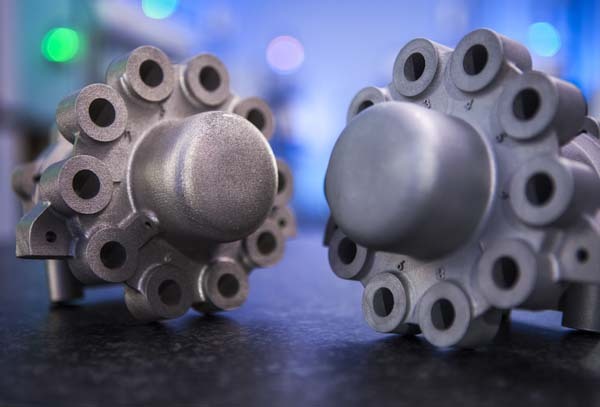 “Increasingly, global manufacturers are becoming aware of the benefits of producing metal parts by additive manufacturing,” said Wohlers Associates in a release announcing its report. Terry Wohlers, president of Wohlers Associates, said in an interview with D2P that a number of factors are fueling the growth. Some companies that are using metal additive manufacturing (metal 3D printing) machines have passed the qualification and certification phases with flying colors and are now ready to move into production. To make the transition to higher part quantities, they need to add more capacity. “You can get by with one to three machines for qualifying the materials and processes, and then certifying designs, but you need a lot more capacity for production—and, in some cases, dramatically more,” said Wohlers. Yet another significant factor is the swift emergence of a three-year-old company that’s determined to change the way engineering and manufacturing teams produce metal parts. Desktop Metal, Inc., the developer of a technology that promises dramatically faster and lower-cost production of high-resolution metal parts, had a breakout year in 2017 while taking in a reported “several hundred” reservations and orders for its metal 3D printing systems. Based on a new approach to metal 3D printing called Single Pass Jetting (SPJ), the DM Production System™ is said to build metal parts in a matter of minutes, instead of hours. It prints at speeds of up to 8,200 cubic centimeters per hour, which the company says is 100 times faster than laser-based systems (see sidebar below). Desktop Metal has raised more than $277 million in funding from investors enamored with the prospect of mass producing strong, functional, and high-quality metal parts at unprecedented speeds. The Burlington, Massachusetts-based company is on a mission to make metal 3D printing more affordable and accessible, from prototyping through mass production, and has launched two systems—the DM Studio System™ and DM Production System™—to make those goals a reality. 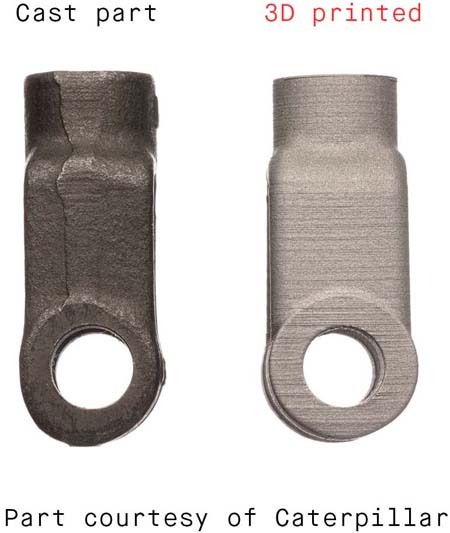 One of Caterpillar’s metal parts, made by a casting process (left), is pictured side-by-side with a metal 3D printed part that was produced on a Desktop Metal Studio System. Photo courtesy of Desktop Metal. The Studio System, designed to bring metal 3D printing to an engineer’s desk or the shop floor, is a complete platform that includes a printer, a debinder, and a sintering furnace. Desktop Metal began shipping the Studio System to early customers—including Google’s Advanced Technology and Products (ATAP) group—in December as part of its Pioneers Program roll-out. 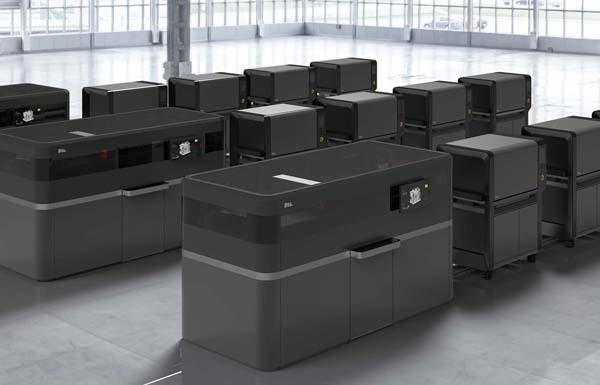 The Production System, designed for mass production of metal 3D printed parts, is currently in development and is scheduled to begin shipping in 2019. Jonah Myerberg, a co-founder of Desktop Metal and the company’s chief technology officer, told D2P that the company has essentially taken a technology that numerous industries have been watching very closely—metal 3D printing—and brought it closer to engineers and manufacturers than it’s ever been before. A finished metal part produced on Desktop Metal’s Studio System. Photo courtesy of Desktop Metal. For engineers, accessibility means a lot of different things. With the Studio System, it means engineers have a ready and affordable means of “rapidly prototyping and evolving real parts,” Myerberg said. Rather than having a “looks like, feels like, fits like” model of a part that hasn’t yet gone into production, the engineer is able to produce a part that is usable, functional, and representative of the final materials and properties. Metal 3D printing has been around for about 20 years, Myerberg said, and has been used for rapid prototyping of metal parts. But it hasn’t been easily accessible to engineers, mainly because it has always been expensive. The process requires big machines, complicated systems, and powdered metals that need to be controlled. That second step is important when an engineer wants to take a part into mass production. Although laser-based metal additive manufacturing technologies are capable of producing real metal parts out of steel, titanium, and aluminum, the microstructures of those parts are much different from those made by traditional production processes like casting, machining, or stamping. That’s because as the metal powder melts, it goes from a solid to a liquid, and then solidifies back into a solid. Because no other part in mass production has that same microstructure, the only way to take that 3D printed part into mass production is to scale the process. That means buying more machines to do more of the same laser welding techniques that produce those properties in a part. It’s a route that most companies simply cannot afford. To avoid this problem, Desktop Metal designed its systems to use metal injection molding (MIM) materials with properties that are familiar to engineers. As the parts come off the engineers’ desks and are tested, their properties are well understood, making it much easier and less expensive to take those parts into mass production via processes like metal injection molding and hot isostatic pressing (HIP). But if you want to take a geometry that’s been designed for additive manufacturing into mass production, that’s where the Desktop Metal Production System comes in, Myerberg said. By introducing technology to make metal parts with well-established properties, Desktop Metal enables engineers to quickly validate their parts. Even though they’re using a new printing process to create their parts, engineers know what they should be getting out of the process because they’re using known materials. Engineers are already familiar with materials like 17-4 stainless steel, 316 stainless steel, or 4140 Chromalloy, all of which can be used by the Studio and Production Systems. Desktop Metal’s combination of lower-cost materials, high throughput (speed), and simple post-processing are said to yield per-part costs that are not only competitive with traditional manufacturing processes, but as much as 20 times lower than competing metal 3D printing systems. The speed of the Production System drives total cost down by eliminating the need to buy more machines to increase production. “The speed allows you to take that overhead—that capital cost—off the table,” said Myerberg. “That [capital cost of the equipment] becomes a fraction of the overall cost of the parts, and then the bulk of the part cost is in the material. The Production System features a number of innovative technologies—such as Single Pass Jetting and Separable Supports—that are unique to Desktop Metal. Although the system’s starting price has not yet been released, it is not expected to be trivial: Multiple industry sources have projected it to fall somewhere in the range of $500,000 to $800,000. If it comes in at the lower end of the range, its cost would be about 10 times that of the Studio machine, which lists at $49,900 for the printer, and $120,000 for the complete system, including debinder and furnace. Smaller companies that can’t afford the Production System are likely to outsource their metal 3D printing production to larger service providers and contract manufacturers with bigger budgets. But Desktop Metal’s claims of dramatically lower total cost—over the service life of the machine—and unrivaled printing speed have companies all over the world taking notice. One of the inventions Desktop Metal is introducing is its patented Separable Supports technology for both its Studio System and its Production System. The technology employs a Ceramic Release Layer™ that enables users to remove support structures for 3D printed parts by hand, even for large metal parts with complex geometries. It is a new approach to metal additive manufacturing that allows multiple materials to be used during printing. Customers often come to Desktop Metal with parts that weren’t designed for additive manufacturing, but instead were designed to be stamped, cast, or manufactured via a more traditional process. When asked “Can you print this?” Desktop Metal’s engineers will say “yes,” but with a bit of advice: To take full advantage of all that additive manufacturing has to offer, customers will need to take a hard look at their designs and begin redesigning them for additive manufacturing. But Myerberg acknowledges that it’s one thing to tell a customer to design a part for additive manufacturing, and quite another for the customer to actually understand how to do it. Myerberg expects that it will take some time before engineers are universally fluent in design for additive manufacturing. Although universities are starting to teach design for additive manufacturing (DfAM), most universities still don’t offer courses in DfAM, he said. “When I went to school, I certainly didn’t learn design for additive manufacturing. Design for additive is new, and so we’re kind of the bridge between the physical world and the digital world—the digital world of CAD and the physical world of parts. We’re connecting the CAD, through a 3D printer, into real parts,” Myerberg said. Terry Wohlers said that the current lack of knowledge around design for additive manufacturing is one of the biggest challenges that will need to be overcome to enable more widespread use of metal 3D printing. It’s important for engineers to learn how to design for the process because the costs of products are heavily tied to their design. If a product that normally consists of 50 different parts of an assembly can be designed to require only half as many parts, that can have a dramatic impact on cost, he said. 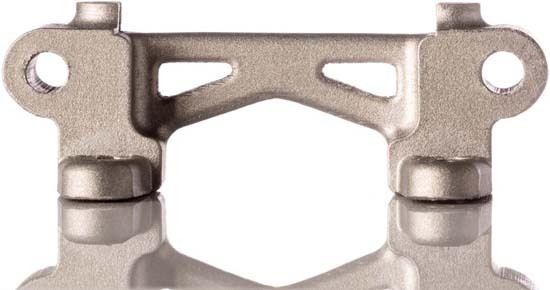 Desktop Metal is working to speed the advancement of design for additive manufacturing through a partnership it established earlier this year with Dassault Systemes and its SolidWorks software brand. The companies have agreed to integrate SolidWorks applications with Desktop Metal’s 3D printing systems, enabling SolidWorks users to preview Live Parts™, an experimental software that Desktop Metal is developing to simplify the process of generative design for 3D printing. The software uses advanced simulation to shape strong, functional parts with complex geometries in minutes. Myerberg said it’s important for the industry to continue to show that metal 3D printing technologies are applicable to mass production, not just prototyping, and that they’re reliable enough to apply to any metals application, rather than being limited to aerospace or medical uses. 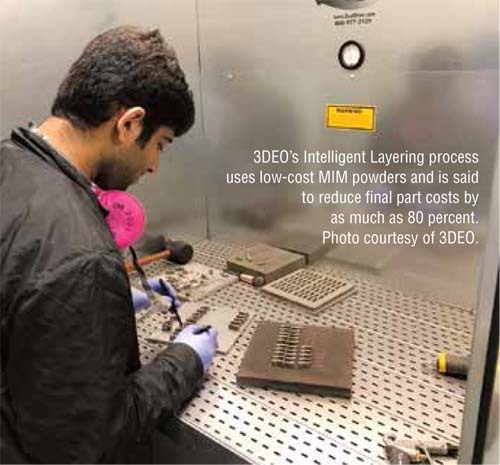 3DEO’s Intelligent Layering process uses low-cost MIM powders and is said to reduce final part costs by as much as 80 percent. Photo courtesy of 3DEO. For Petros and Torabi, the answer was a design that doesn’t use an inkjet to spray the binder. Instead, it uses a low cost spray head that lacks the complexity of an inkjet and leverages established technologies like CNC milling for excellent repeatability and reliability. 3DEO’s technology, Intelligent Layering®, is said to unleash the potential of additive manufacturing by reducing final part cost by as much as 80 percent while meeting the MPIF Standard 35. Sand cites three main contributors to the low part cost—extremely low machine cost, the use of off-the-shelf commodity materials, and creative software design. 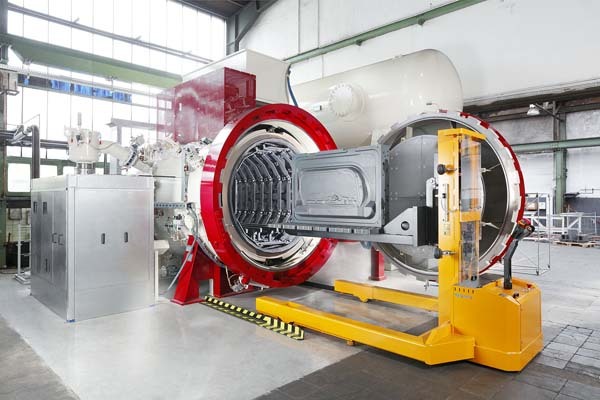 Once 3DEO’s Intelligent Layering process is complete, the part goes into a MIM furnace for sintering. Finished parts resemble MIM parts, but are created without the cost of creating a metal injection mold. Photo courtesy of 3DEO. “The way we think about our process is ‘MIM (metal injection molding) without the molds,’” said Lance Kallman, 3DEO’s vice president of business development, in an interview at Singularity University’s Exponential Manufacturing Summit in Boston. “The founders actually created the technology with low cost in mind because there’s obviously a very high end market for metal additive right now. So they created a process that ties to the metal injection molding standards MPIF 35 (Metal Powder Industries Federation’s Materials Standards for Metal Injection Molded Parts). Sand said it offers two capabilities—dynamic layering and three-dimensional cutting—that are unlike anything else seen in today’s 3D printing processes. He used the example of a simple part geometry, a straight extrusion with a flat side, to illustrate dynamic layering. Rather than having to cut each layer as it’s being built one layer at a time, 3DEO can cut 20 layers at a time with a single cut of its CNC end mill. “The benefit of that is we can go a lot faster, but just as importantly, the side finish of that part is going to be much cleaner because it’s just one cut, rather than having to try and perfectly align 20 different cuts,” said Sand. Sand, a U.S. Air Force veteran with an undergraduate degree in computer science from Tulane and an M.B.A. from UCLA, is part of a new wave of manufacturing leaders who come to manufacturing with a technology background. “If there were 40 hours in a day, I’d be programming four to five hours a day—I really love it!” he said. Software and data analytics have played, and continue to play, key roles in building 3DEO’s unique technology and making its factory more efficient. Each of 3DEO’s machines uses dozens of sensors and cameras that collect operations data as parts are built. The data is then used to help analyze whether each part has met requirements. Digital dashboards give 3DEO’s staff real-time feedback on what’s occurring in the factory, tying together everything from operations efficiency to factory capacity. When a customer wants to place an order, 3DEO’s sales team can see in real time the available capacity of the factory and when they’d be able to deliver the parts—all without having to call the manufacturing manager. Sand credits the machine sensors with enabling the generation of real time data that allows 3DEO to do analytics on what they’re seeing, and predictive analytics on what’s coming next. Sand believes it’s an exciting time for manufacturing, and for metal 3D printing in particular. He said that for the first time in his many years as a sales person, when he first calls a prospect, he invariably gets a call back. Sintavia, a metal additive manufacturing supplier in Davie, Florida, has centered its business model on growing an ecosystem of additive manufacturing expertise inside the walls of its vertically integrated manufacturing facility. The company is unusual in that sense. Rather than outsourcing or subcontracting work to additive manufacturing suppliers, Sintavia has taken pains to develop and nurture what amounts to a complete 3D metal manufacturing supply chain—mainly for the aerospace and defense industry— within its own facility. Even though Sintavia can be characterized as an additive manufacturer, Hedges said, that only begins to tell the story of the company’s depth of expertise. Quality is a prominent issue in aerospace manufacturing, as it is for all critical industries, and Sintavia prides itself on quality control. The result is sheer throughput. In the time that it takes laser based processes to produce just 12 impellers, Desktop Metal’s Single Pass Jetting technology would have produced more than 500, the company says.